Drysdale artist Justine Martin has taken home the prestigious Allan Merigan People’s Choice award for the second year in a row at this year’s State Trustees CONNECTED Art Exhibition. More than 1000 people voted in the awards at the Federation Square exhibition and online. 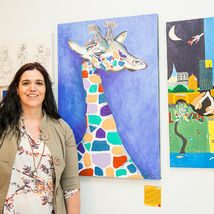 Justine received the highest number of votes out of more than 150 entries, winning a $500 prize for her bright and vibrant artwork, Basil – a large acrylic pastel giraffe. Justine’s story as an artist is a relatively new one beginning in 2012 following her diagnosis with Multiple Sclerosis (a degenerative central nervous system disease). Unable to continue working, Justine took up painting with acrylics, watercolours, lime stone sculpting and crafting simple drawings with graphite and ink. Justine said she could not believe that, with the high standard of work in this year’s competition, she her work received the People’s Choice award for the second year in a row. “When I got the call that I had won, I was just gob smacked. I never in my wildest dreams thought I could achieve so much with my art – I only started painting to fill up my days after I couldn’t work anymore due to the MS,” she said. Justine also competes in Olympic Weightlifting and is the current Victorian Masters 40-44 year old+75kg State Champion. To keep up to date with Justine’s next creations, visit her Facebook page, Juzt Art. For information on the other 2014 State Trustees CONNECTED Art Exhibition prize recipients, highly commended and exhibiting artists please visit our prize news page.